Here is my latest contribution to Project Pastry Queen. 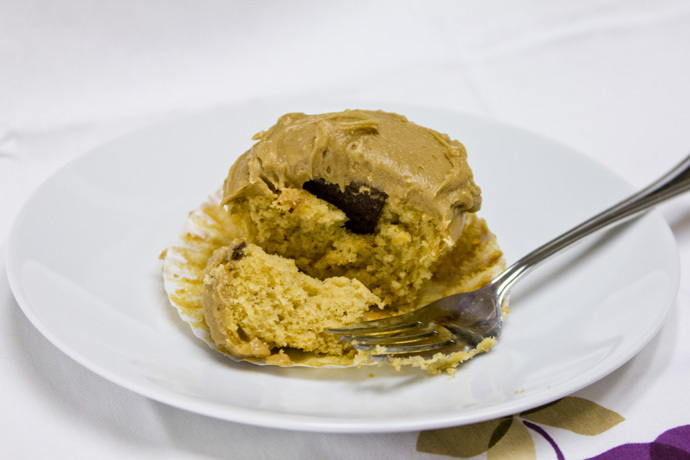 These cupcakes are a bit like a peanut butter cup, with the chocolate in the middle instead of on the outside. They have just the right combination of peanut butter accented with brown sugar, and a surprise of dark chocolate hiding in the middle and peanutty penuche icing (penuche is a brown sugar fudge-like candy). 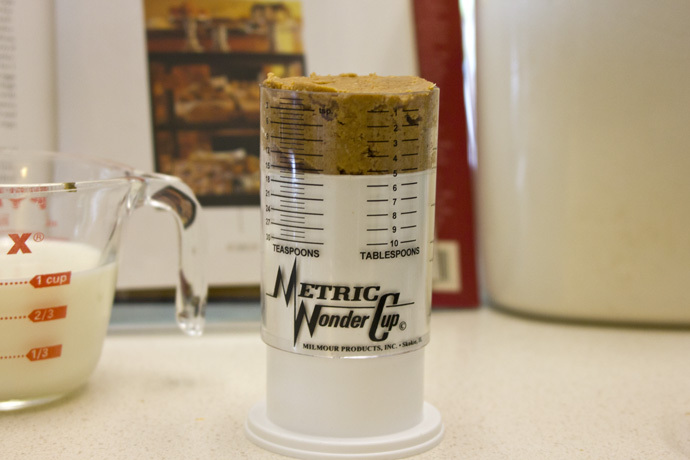 The Wonder Cup is incredibly handy for measuring sticky or gooey foods like peanut butter, honey, tahini, etc. Beat the batter until smooth and creamy. 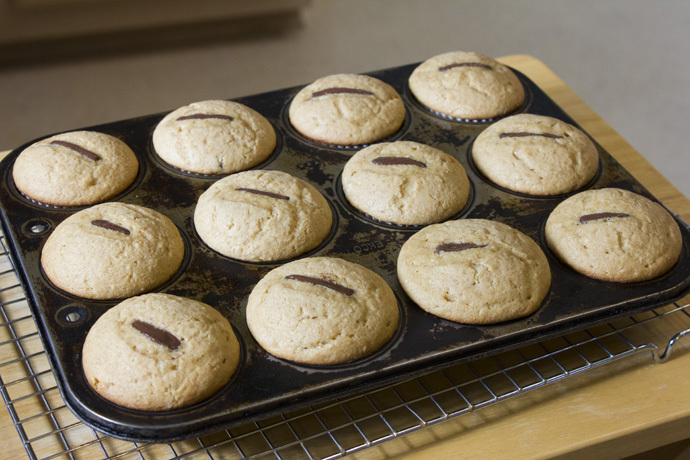 Scoop the batter into prepared muffin tins, and put a piece of chocolate in the middle of each one. As the batter rises, it surrounds the chocolate. Boil the icing, then let it cool before adding the powdered sugar. Preheat oven to 350°F. Line 2 12-cup muffins pan with cupcake papers (line 16 of the cups). In a mixer fitted with the paddle blade, beat the butter until smooth. Add the sugar and mix well. Beat in peanut butter, milk, vanilla and eggs. Add flour mixture and mix to combine. Scrape sides of bowl well, then beat at medium-low speed for one minute. Increase speed to medium-high and beat for 1 1/2 minutes. 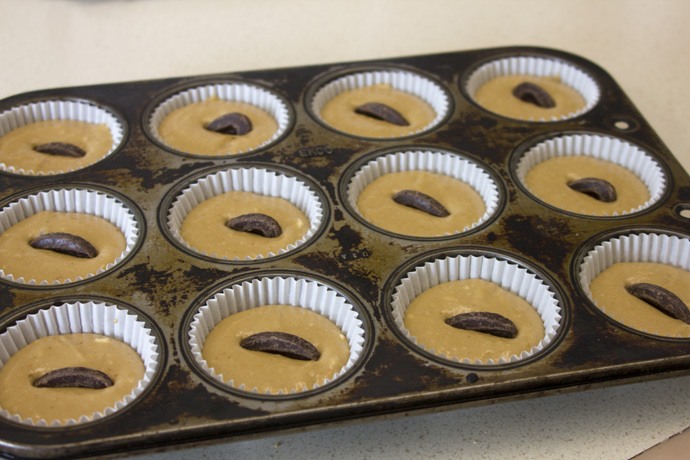 Use a ¼ cup scoop to portion batter into prepared muffin cups. Press a piece of chocolate into the middle of each cupcake. Bake for 18-20 minutes, until tops are very lightly browned and a toothpick inserted comes out clean. Cool on rack for 10 minutes. Remove from pan and cool on racks completely. 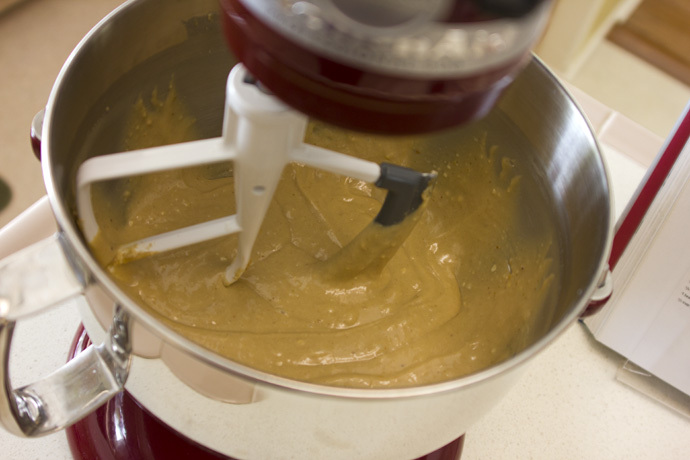 To make the icing: Combine butter, peanut butter, milk, sugar and salt in a 2-quart saucepan over medium-high heat. 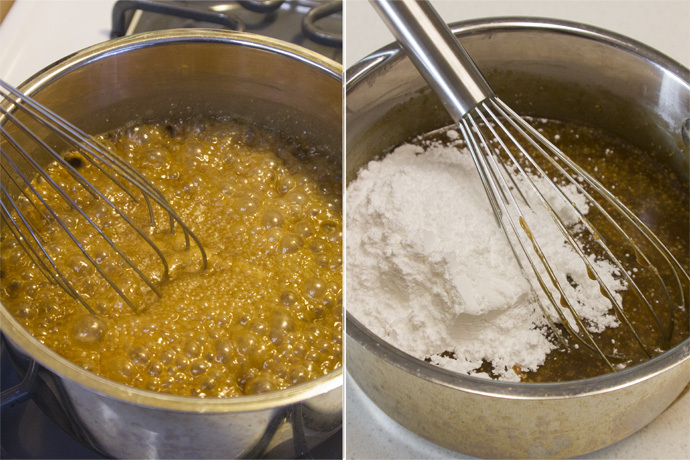 When butter is melted and mixture has come to a low boil, reduce heat to medium and cook for 2 minutes without stirring. Remove from heat and cool 20-30 minutes. 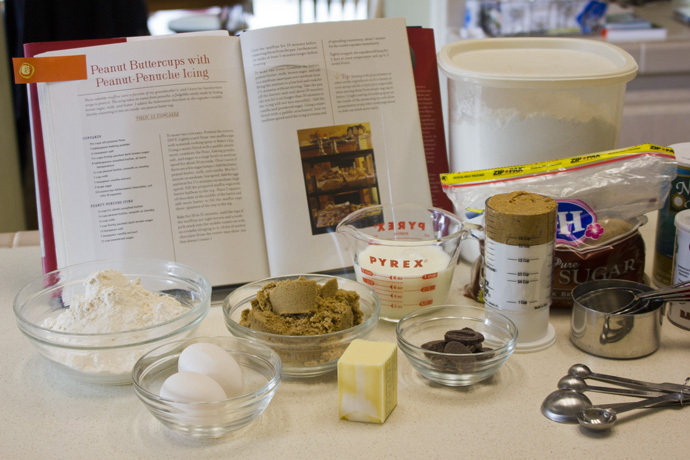 Place in mixer bowl fitted with paddle, add powdered sugar and vanilla, and beat until icing is smooth and thick enough to spread. Ice the cupcakes immediately, as the icing can set up very quickly. Each cupcake contains a chocolate surprise in the middle. Yum! Your cupcakes look great. Love how you put the chocolate in vertically so it sticks out the top. I thought it was another successful PPQ recipe! I took these to work today and there were some comments that the cake and icing were too similar, and perhaps a chocolate/peanut combo might be better. 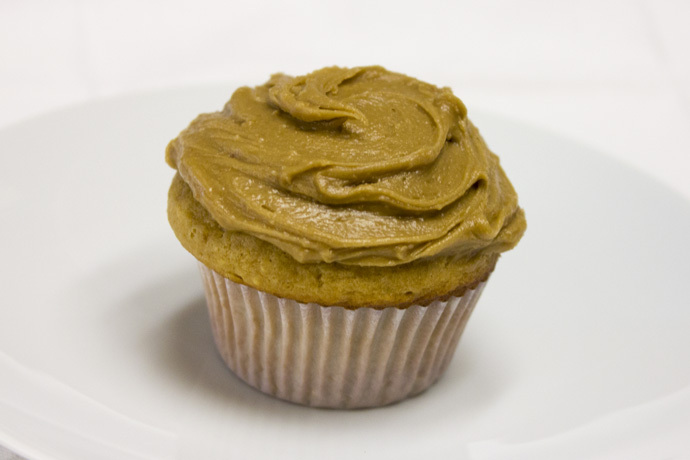 Peanut butter cupcakes with chocolate icing? 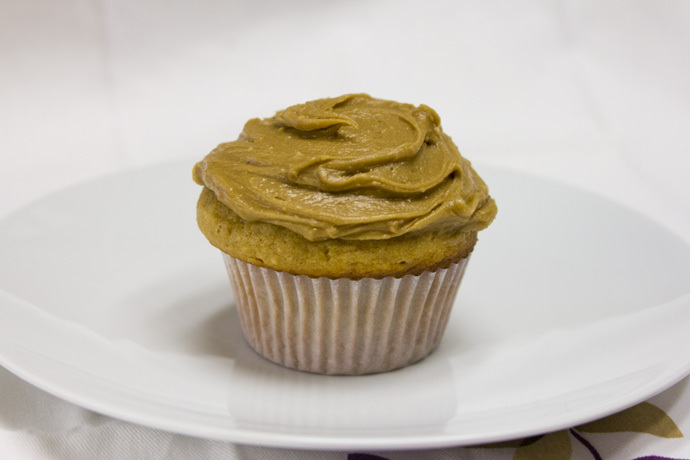 Chocolate cupcakes with peanut butter penuche icing? Both ideas sound delicious to me.